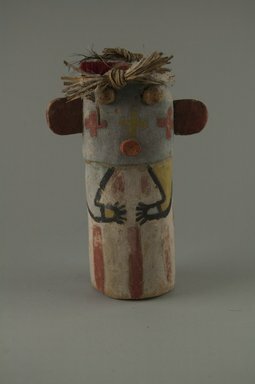 This kachina is probably Ho'te. It is totally rounded in form with flat, red ears protruding from each side, protrduing round eye and yarn twists and plant fiber on it's head. There is a cross also on the back of its head ad wel;l as cheekbones. Hands are cruved in front resting on the stomach.